Care: Found on pebbly bottom of slow-flowing shallow streams. The aquarium should aim to match these conditions with good filtration and some flow. A sandy area should be provided for digging purposes. Subdued lighting. Feeding: Feeds on insects in wild. Will eat most proprietary aquarium foods, supplemented live and frozen foods. 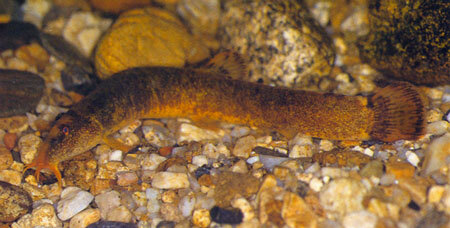 Lives in streams that have heavy weed cover. Unlikely to have entered the ornamental fish trade, but might arrive as a contaminant with other species.